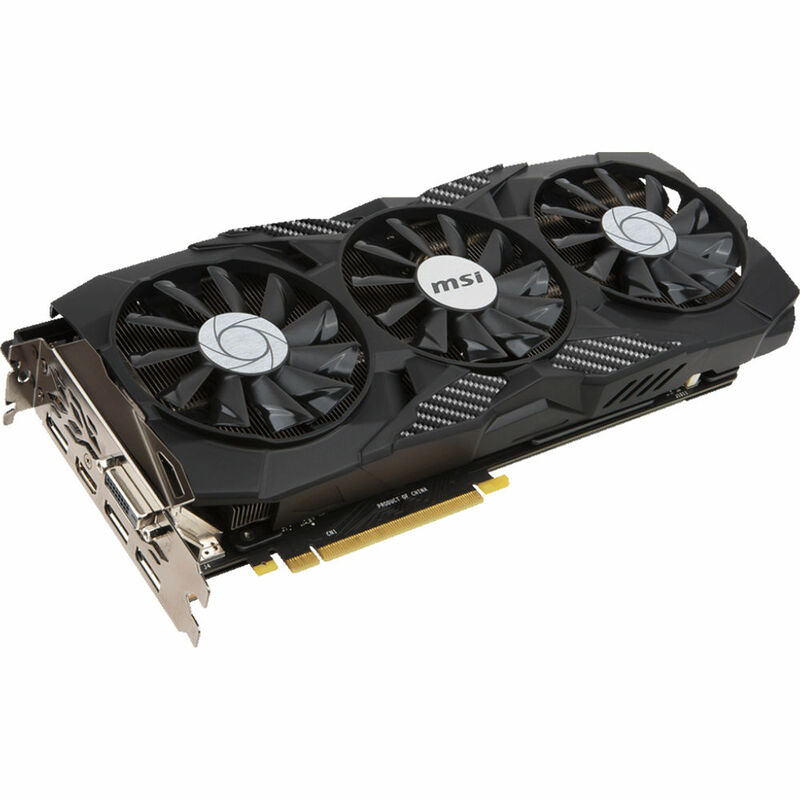 With an overclocked core, slightly overclocked memory, customizable LED lights, and based on NVIDIA's Pascal architecture, the MSI GeForce GTX 1080 DUKE 8G OC Graphics Card provides major improvements in performance, memory bandwidth, and power efficiency over its predecessor, the high-performance Maxwell architecture. It also introduces innovative graphics features and technologies that redefine the computer as the platform for playing AAA games and taking full advantage of virtual reality via NVIDIA VRWorks. The front panel of the card features a variety of outputs. There are three DisplayPort 1.4 outputs in addition to an HDMI 2.0b output and a DVI-D Dual-Link output. The GTX 1080 is not just about high-resolution gaming. Computationally intensive programs can utilize the GPU's 1920 cores to accelerate tasks using CUDA or other APIs. For cooling, MSI features triple PWM fans. This GPU also utilizes MSI ZeroFrozr technology to eliminate fan noise by stopping the fans in low-load situations. There is also a matte backplate and a LED illuminated DUKE logo, which can be controlled with MSI Mystic Light. With a compatible motherboard and a connecting bracket, two or more NVIDIA GPUs of the same model can combine processing power using NVIDIA's Scalable Link Interface (SLI). How the cards work together can be customized to suit your preferences. Alternate frame rendering has each alternating card prepare the next frame, essentially multiplying the capabilities of a single card's maximum capable frame rate output. Each card in the configuration can also be used to improve anti-aliasing by being able to process an image in parallel with the other cards before filtering out jagged edges. NVIDIA's SLI HB bridge doubles the available transfer bandwidth compared to the NVIDIA Maxwell architecture. Delivering smooth gameplay, it's an effective way to enjoy surround gaming and it's only compatible with the GeForce GTX 1080 and 1070 graphics cards. Note: The benefits of SLI will vary based on component configuration. Box Dimensions (LxWxH) 15.0 x 10.3 x 3.25"
GeForce GTX 1080 DUKE 8G OC Graphics Card is rated 5.0 out of 5 by 2. Rated 5 out of 5 by Manoah from Best card! Honestly one of the best 1080s out there for this price. Card operates at very cool temperatures under heavy load and the back plating looks great if you're concerned about aesthetics. Rated 5 out of 5 by Michael from First Graphics Card I've Bought I was looking for a graphics card to use, and it was between a 1080 and a 1070. I ended up settling on this and it hasn't let me down. I can play all of the games I have, so I'm pretty happy with it. Can I use this on ASUS ROG STRIX Z370-E GAMING LGA 1151 ATX Intel Motherboard?